Through chemigation, insecticide is combined with water, sent through the pivot and applied to the field, just as water is applied to the field through the irrigation system. Toews, a UGA Cooperative Extension scientist, researched this method in the field last year at UGA’s C.M. Stripling Irrigation Research Park in Camilla, Georgia, and will continue his studies this year. Cotton growers currently control stinkbugs, a key pest of cotton, through use of a ground rig or aerial application. At times, farmers struggle to make critical, timely applications. Problems like malfunctioning equipment or heavy rainfall can keep a sprayer out of the field, or a grower may have multiple fields that need to be treated at the same time. To treat those fields in a timely manner is cumbersome, said Toews, who believes chemigation could be the solution. Timely treatment for stinkbugs is critical, as the bugs feed directly on developing bolls, thereby reducing lint yield and fiber quality. The resulting cotton is downgraded in quality and not worth as much at market. “Stinkbugs require insecticide application every year in Georgia. It’s an area where we’ve struggled to make timely applications in the past. It was a logical starting place for this research,” Toews said. In laboratory tests, Toews compared the effectiveness of insecticide dilutions to control stinkbugs through use of a ground rig and through chemigation. “The lab results suggest that we could get good knock-down and mortality of these insects using these different application methods,” he said. So far, Toews’ biggest challenge has been keeping the active ingredient on the plant, where it can reach the intended target. In chemigation, the majority of the liquid ends up on the ground. While the application produces excellent coverage, most of it ends up on the ground, and the relative dose that comes into contact with the stinkbug is small, according to Toews. 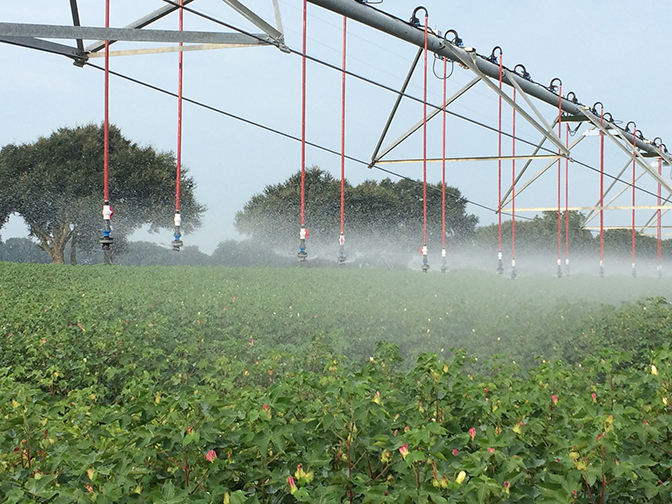 Despite these challenges and the need for another year of data, Toews is confident that his team at UGA will have solid recommendations for Georgia cotton growers by the end of the year. “If the research produces promising results, chemigation could be a popular insecticide delivery method with growers. Conversely, learning that this method is less than optimal will provide growers with the tools they need to make informed decisions when managing stinkbugs in cotton,” he said. Toews is preparing to focus on other pest species in the near future. The Georgia Cotton Commission is funding the study.